I must admit that the Mazda 626 has spent its entire existence without really registering on my personal automotive radar screen. A generic-looking Mazda sedan with no rotary? Yet the first-generation 626 sold quite well and gained a reputation for reliability... and now most of them are gone forever, fed into the ravenous jaws of The Crusher. So even though it's no AE86 or RX-7, this car has earned DOTS status by surviving everyday use for 26 hard years. 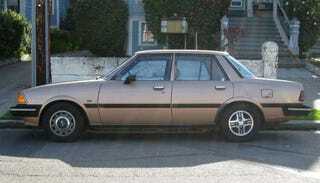 1982 was the last year of rear-wheel-drive 626s sold in North America. And, hey, it's the much-coveted Luxury edition! The 626 Luxury sedan listed at $8,895 in '82, nearly $2,500 more than the '82 Chevy Cavalier sedan. This one is pretty rough, covered with battle scars and daily-driver glory. The mismatched wheels add to its tough-veteran appearance.